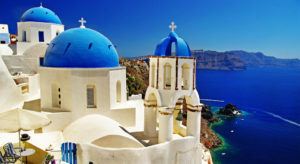 This tour is an 12-day exploration of Greece and the Greek Islands. You will experience this amazing country led by those who know it best. Get ready for the trip of a lifetime! Travel from your home city to Athens, Greece. Arrive in morning of the next day. Welcome to Greece! Take time to check in to the hotel and relax or wander around the streets of Athens on your own. In the early evening, meet your group of fellow travelers, tour guides and director during Tour Orientation. You will learn more details about the trip at this meeting. 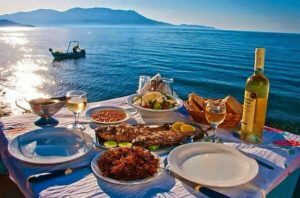 Afterward, we’ll enjoy a Welcome Dinner at a select restaurant featuring traditional Greek cuisine. 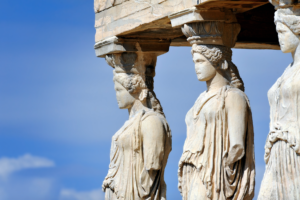 Today, we’ll take a guided tour of the Acropolis of Athens – the citadel of ancient Greece. It is the icon of the ancient Greek civilization and a UNESCO World Heritage Site. Our visit will include the Parthenon, the Temple of Zeus, the Theater of Dionysus and the Temple of Athena Nike. In the afternoon, we’ll visit the Acropolis Museum which houses original pieces from the temples of the Acropolis, artifacts retrieved fro the Acropolis’ slopes, pre-historic Greek, Roman and Byzantine artworks and everyday objects. We’ll enjoy lunch followed by free time in the Plaka District, the oldest section of Athens under the slopes of the Acropolis. Plaka is one of the most beautiful areas of Athens. It’s streets are narrow, winding and closed to traffic. 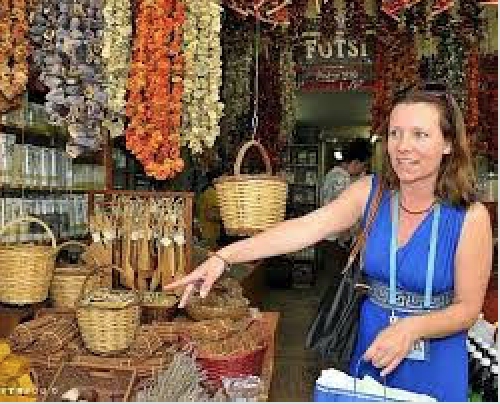 It is a treasure trove of Neo-classical mansions, houses with red roofs, squares, balconies with flowering geraniums, bougainvilleas, and jasmines, interesting shops and street cafes. The evening is free time to relax at the hotel, see more of Athens on your own or join new friends for dinner. Today, we’ll experience Greece through its culinary world! Discover another side of Athens where a kaleidoscope of colors, smells, textures and tastes await. 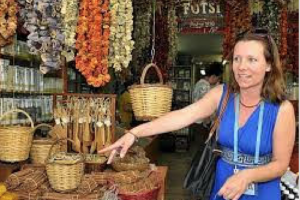 We will visit Athens Central Market, specialty food shops, restaurants, dairies, spice shops, bakeries and more. Today is about tasting Greek cheeses, olives, wines, filo-layered pies, doughnut balls drenched in honey, seasoned grilled meats with fresh veggies and Greek beverages. 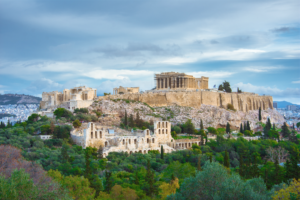 You’ll gain insight into Greece’s fascinating food culture, the evolution of the country’s cuisine and learn about locally produced organic ingredients. The afternoon will be free time to relax at the hotel, shop or see more of Athens on your own. In the evening, we will attend a local concert or cultural event at the Acropolis (TBD when schedules are announced). Today, we’ll embark on a two-day excursion to Delphi & Meteora on the mainland north of Athens. We’ll travel by private coach. The Temple of Apollo at Delphi is the ancient Greek religious sanctuary where Pythia, the oracle, was consulted and prophesies were made about important decisions. 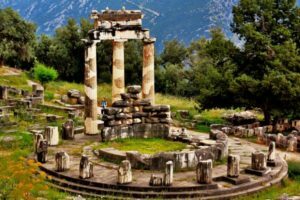 The Greeks considered Delphi the center of the world. This is where offerings to the gods were kept and where cult rituals took place. The Temple of Apollo, completed in 327 BC, is a classic example of Doric architecture in a beautiful setting. We’ll tour what remains of the temple and visit the Delphi Museum. 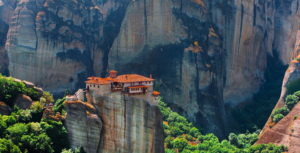 Later that day, we’ll drive to Kalambaka at the foot of Meteora and enjoy dinner at a family-run restaurant. Being in Kalambaka will be a nice change of pace after three days in Athens. Today, we’ll explore the monasteries of Meteora by hiking to them! This is one of the best ways to enjoy this unique geological phenomenon and to learn the history of this UNESCO World Heritage Site. We will walk through hidden trails, amongst the gigantic rock pillars of Meteora to enjoy breathtaking views while following the footsteps of the first monks. Here are only some of the words people to use to describe Meteora: serene, spiritual, magical, mystical, breathtaking and immense. The first monks arrived in the 14th century and established an entire monastic community perched on top of giant rock formations. They built the six unique monasteries using only ropes and pulleys. This location was, and still is, the perfect place to achieve isolation and find spiritual elevation. Meteora is truly inspiring but more than just its incredible physical setting, is that it is a holy place. Get ready for a life experience! Later that day, we’ll head back to the Athens and stay at an airport hotel in preparation for our flight tomorrow to the islands. 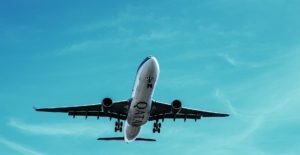 We will take a morning flight from Athens to Mykonos Island. After a busy time, this will be an opportunity to unwind at our lovely beach hotel. The afternoon will be free to sit on the beach, enjoy a swim or rest. 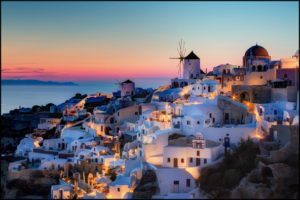 That evening, we’ll walk into Mykonos Town, wander the narrow streets, stop in some of the chic shops and enjoy dinner at a select beachfront restaurant. Today, we’ll set sail on a catamaran for a unique private sailing experience. We’ll sail around the southern coast of Mykonos Island toward unspoiled coves and swim/snorkel in the turquoise waters of the Aegean Sea. We will find two protected coves. Snorkel gear will be provided. We’ll enjoy a full Mediterranean lunch cooked on board and served in the loveliest of settings. An open bar of water, sodas, beer and wine is included on board the catamaran. We’ll return in the afternoon and have the evening at leisure. In the morning, we will spend time exploring Old Mykonos Town, walking its narrow streets stuffed with chic boutiques, art galleries, seafood restaurants and bars. We’ll also visit the old windmills of Mykonos (Kato Mill) that stand majestically in a row on a hill overlooking the sea. The windmills are an icon of Mykonos and a great photo opp! Then we’ll board the ferry to Santorini. We’ll arrive in the afternoon to this iconic Greek island with its cubiform white-washed houses and bright blue roofs. The houses cling to cliffs above an underwater caldera (crater) formed by a volcanic eruption. We’ll have time in the afternoon for leisure at the hotel taking in the Aegean Sea views. Heaven on earth! Then we’ll head to Oia. We’ll wander the narrow streets of Oia and shop a bit before dinner. Oia is known for sunset watching. This is one of the most beautiful spots in the world! We will enjoy the sunset that evening with dinner at a select Oia restaurant. Today, we will take the caldera hike from Fira to Oia – but only a portion of it. 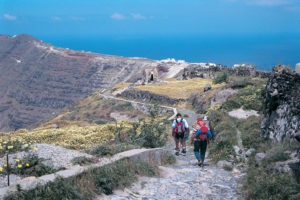 The Fira-Oia hike is one of the highlights of visiting Santorini. It takes guests along the caldera cliff with unparalleled views in every direction. We’ll pass through villages, stopping wherever we want to rest or check something out further. This is a moderate hike on a trail that passes through villages along the coast. (There will be an alternate activity for those who do not want to hike.) The evening will be at leisure. Today, we’ll take in Santorini’s Mediterranean food and wine. We’ll visit two premier wineries in the countryside and sample their wines. The wines Santorini produces are mainly whites and dessert wines. We will be led by a wine expert who will also give us a an introduction to wine tasting. We will sample traditional Greek aperitifs. In the afternoon, we’ll join a Greek chef in a restaurant and enjoy a Greek cooking lesson making traditional dishes. Then, we’ll sit down with a bottle of wine and enjoy the feast we made! This could be the BEST day of the trip, but who can decide? The evening will be free to relax at the hotel or go out with new friends and explore Santorini on your own. Today is a free day to relax at the hotel, pack and get ready for the evening flight to Athens. Time permitting, we might wander into Fira on our way to the Santorini airport. Once in Athens, the tour will officially be over. Those going home will spend the night at an Athens airport hotel in preparation for the flight tomorrow. You will be responsible for your hotel room this night. Today, you will travel home from Athens based on your flight arrangements. Note: The daily itinerary is subject to minor revisions until all deposits have been received.